Outstanding Bordeaux Leads Skinner's Fine Wines Auction | Skinner Inc.
Bordeaux is the star of this sale, represented by a strong selection of first growth wines and vintages spanning 1959 to 2011. Classic offerings on the block include cases of Chateau Mouton Rothschild 1995 (Lot 244, estimate $3,750 to$5,000), Chateau Lafite Rothschild 2002 (Lot 238, $5,500 to $8,000), and Chateau Haut Brion 1988 (Lot 233, $3,000 to $4,500), in addition to three bottles of Chateau Lafite Rothschild 2008 (Lot 93, $1,500 to $2,200). 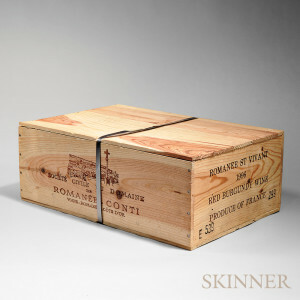 Exceptional Burgundy up for auction includes a case of 1996 Domaine de la Romanee Conti Romanee St. Vivant, hailing from a pristine cellar (Lot 140, $8,000 to $12,000). 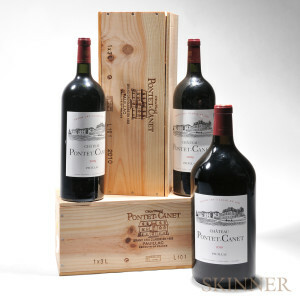 For grand occasions, Skinner will offer several superb large format bottles, including two double magnums of Chateau Pontet Canet 2010 (Lot 127, $900 to $1,200), three magnums of de MontillePommard Les Rugiens 2011 (Lot 184, $375 to $525) and a jeroboam of de Montille Volnay Les Tallepeids 2011 (Lot 189, $250 to $400). The perfect addition to an eccentric cellar, a rare original wooden case of 1967 Portuguese dry table wine, Caves Sao Joao Reserva Particular Vinho Tinto, will also be on offer (Lot 58, $600 to $900). Leading a choice assortment of fine spirits at auction are twenty-seven lots from a stellar private collection, with standout offerings including decanter number three of Remy Martin Louis XIII Black Pearl (Lot 279, $20,000 to $24,000); The Macallan 55-Year in Lalique Decanter (Lot 291, $15,000 to $18,000); Macallan Select Reserve 1946 (Lot 292, $6,000 to $8,000); and Hennessy Ellipse (Lot 284, $6,000 to $9,000). 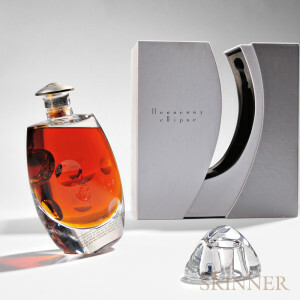 Additional sought-after spirits include a pre-Louis XIII bottling of Remy Martin’s “Age Unknown” cognac in a very familiar Baccarat decanter (Lot 307, $2,000 to $3,000), and 23-Year Old Rip Van Winkle Family Selection Decanter Set (Lot 308, $4,500 to $6,000). Closing the auction is a section of over two dozen lots of ales, representing some of the finest brews on Earth, while satisfying a range of buyers’ budgets. The assortment spotlights examples from Cantillon, DrieFonteinen, Russian River Brewing Company, and Goose Island. Place bids from anywhere, anytime, during an accompanying online-only auction, beginning March 2 at 12:00 P.M. ET and concluding on March 11 at 4:00 P.M. ET. Buyers will discover myriad wines to enjoy, from selections of Bordeaux to California rarities such as Sean Thackrey Andromeda and a grouping from Colgin Cellars. To arrange for a preview, please contact Marie Keep, Director of Skinner’s Fine Wines Department, at 508-970-3296 or finewines@skinnerinc.com. The illustrated catalogs for #2787B and #2787T are available from the Subscription Department, at 508-970-3240, or from the Gallery. The Skinner website enables users to view every lot in the auctions, leave bids, order catalogs and bid live, in real-time, through SkinnerLive! and Bidsquare. This entry was posted in News and tagged Ales, Andromeda, auction, Baccarat decanter, bids Bordeaux, Bordeaux, boston, bottles, brews on Earth, burgundy, california, Cantillon, Caves Sao Joao Reserva, cellar, Chateau Haut Brion, Chateau Lafite Rothschild, Chateau Mouton Rothschild, Chateau Pontet Canet, cognac, Colgin Cellars, de Montille Volnay Les Tallepeids, decanter, Domaine de la Romanee Conti Romanee St. Vivant, DrieFonteinen, dry, fine ales, Fine Wines, Goose Island, Hennessy Ellipse, jeroboam, Lalique Decanter, live, Louis XIII, Macallan, Macallan Select Reserve 1946, magnums, Marie Keep, MontillePommard Les Rugiens, Old Rip Van Winkle, online, Portuguese, Remy Martin Louis XIII Black Pearl, Remy Martin’s “Age Unknown”, Russian River Brewing Company, Sean Thackrey, skinner, spirits, table wine, Vinho Tinto, vintages, whisky by Skinner. Bookmark the permalink.